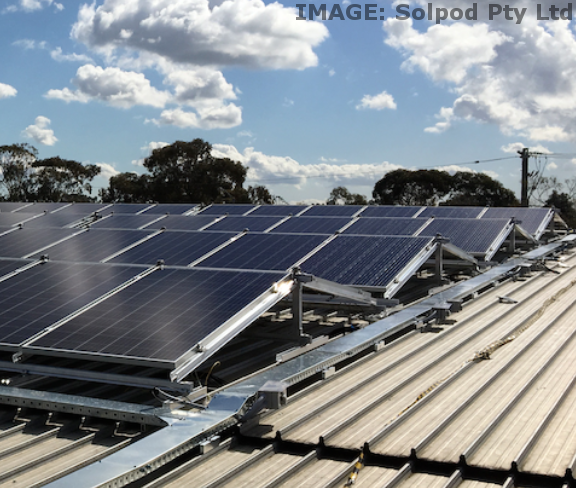 Australian start up Solpod has received nearly $1 million to trial installing re-deployable rooftop solar on commercial and government buildings. Solpod use a new way of fixing solar panels to roofing using a removable racking and mounting system, offering the ability to quickly take down the panels. This innovation allows commercial tenants to access rooftop solar, where they otherwise would have baulked at installing a permanent system. The $5 million project will see Solpod’s re-deployable solar panel systems installed at 25 sites across Victoria, New South Wales and Queensland totalling nearly 2.5 MW capacity, with each site possessing up to 100 KW of solar PV. On behalf of the Australian Government, ARENA is committing $975,000 towards the project. In partnership with ERM Power, Solpod will be trialled at shopping centres, commercial and government buildings – owned by property owners including GPT and Property NSW, who will each install 10 pods. Solpod’s system involves manufacturing prefabricated commercial scale solar panels raised on aluminium pods which are fixed with industrial strength adhesive to the roof surface. Solpod’s ‘pods’ are manufactured in Melbourne, and can be installed in a matter of hours. Solpod’s pods can also be able to be rolled out in any size configuration, helping building tenants benefit from rooftop solar PV too. ARENA CEO Darren Miller said Solpod’s innovative system opens up new markets for rooftop solar installation. “Solpod’s new way of installing solar will pave the way for businesses who were previously locked out of rooftop solar to take up renewable energy solutions and options under shorter term power purchase agreements,” he said.